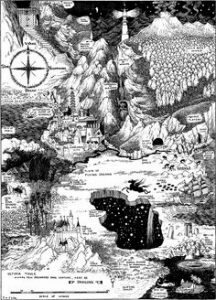 Last year, we featured Lord Dunsany’s Book of Wonder, and mentioned what a huge influence it was on many other contemporary writers at the time. You can read that entry here, and discover more about one of Ireland’s most prominent figures in SFF writing. This year, we want to revisit this entry for IFF by featuring a piece about The Book of Wonder by another well known member of SFF and supernatural writing. H.P. Lovecraft was not an Irish writer, but after reading Dunsany’s book, he wrote this poem, recollecting his experience of reading The Book of Wonder. Dunsany’s reach is obvious here; directly affecting another major author of the time. Lovecraft continues to be both a controversial and well known figure in supernatural horror writing, and despite his often extreme personal views, his work and iconographic characters permeate science fiction and fantasy. This poem is an interesting response from one author to another. We also wanted to give a bit of a shout out to our supporters, authors and fans this week. Irish Fiction Friday is a big task behind the scenes, but we really feel that the support we’ve been given for it has been amazing. We’ve had book launches and exclusives, long chats at conventions and suggestions for many authors that we’d never have known about. Publishers, authors and readers have all supported Irish Fiction Friday, and through it we feel that the diversity and talent that Ireland has to offer has really shone through. Finding an free extract of fiction every week is a big task, echoing the vast amount of work our volunteers put in whilst they work towards bringing a Worldcon to Ireland for the first time! 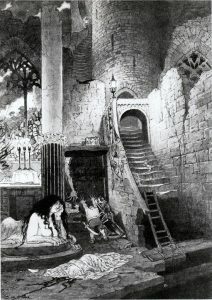 And, well, it gives us another opportunity to link more of Sidney Sime’s artwork from Dunsany’s Book! On Reading Lord Dunsany’s Book of Wonder. And blazing glories—sphere on sphere. Happy Irish Fiction Friday, everyone! Worldcon 75 and Dublin 2019 News!